It took Brynjar Karl Birgisson 11 months to complete the world's largest Titanic replica, using only Legos. 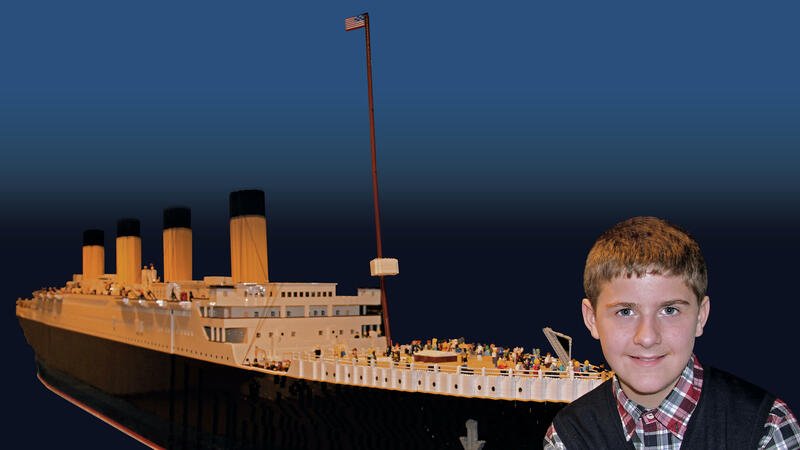 The world's largest Lego Titanic replica went on display Monday at the Titanic Museum Attraction in Pigeon Forge, Tenn. It initially began as Brynjar Karl Birgisson's ambitious idea and took 56,000 Legos, 11 months and 700 hours to complete. The Icelandic boy built the 26-foot-long, 5-foot-wide ship when he was 10 years old with the help of his mother and grandfather. Birgisson, now 15, has spent the last five years following the replica around the world as it travels to different exhibitions, from Norway to Germany. But he says that in Tennessee, with finishing touches done and additional lighting, he's watched the replica come alive. "The first ship that I ever discovered on the Internet when I became a ship fan, or into ships, was the Titanic," he says. "And [it] just was so beautiful that I wanted to make the Lego ship out of it because it was such an inspiration for me. I loved it, and I chose it." Bjarney Lúðvíksdóttir: My reaction in the beginning was, "Here he is asking me to assist him with — we call it 'the crazy project.' " And in the beginning, I was not going there in my mind. But he was determined, so I went for it with him. We used crowd-funding to raise the money for the Lego bricks actually. Birgisson: Well, first of all, autism ... is not a negative thing. It is a gift, because many people [with autism] are really intelligent — like many people [with autism] can do stuff too. We are people as well. We just seem a little bit different on the outside, but the inside, we're always the same. Lúðvíksdóttir: It's indescribable. I mean, we never thought that this project would take us — the family — on this journey. To tell you the truth, in the beginning, it was only to train him and teach him to start something and finish it. But when we discovered it was motivating other kids, and it was also like a lesson for other kids that have autism, that they can do whatever they can if they just follow their dreams and don't give up, I mean, we were amazed. Alyssa Edes and Reena Advani produced and edited the audio story. Sydnee Monday adapted it for the Web. A boy with autism in Iceland has built the world's largest Lego Titanic replica. It's 26 feet long, 5 feet wide and took 56,000 Legos to build. Brynjar Karl Birgisson built the replica when he was 10 years old with the help of his mother and his grandfather. He's now 15. And he has spent the last five years following it around the world as it travels to different exhibitions. The Lego replica is now on display at the Titanic museum attraction in Pigeon Forge, Tenn. And Brynjar joins us from there. Hello, welcome. SHAPIRO: And I understand your mother, Bjarney Ludviksdottir, is also there. Hello. SHAPIRO: If I could start with you, Brynjar, why the Titanic? BRYNJAR: The Titanic, it's such an inspiration for me because the first ship that I ever discovered on the internet when I became a ship fan, or into ships, was the Titanic. And it just was so beautiful that I wanted to make the Lego ship out of it because it was such an inspiration for me. I loved it, and I chose it. SHAPIRO: And I'd like to ask your mother, Bjarney. When your son said, I'd like you to buy 56,000 Legos, so I can make a model of the Titanic, what was your reaction? LUDVIKSDOTTIR: My reaction in the beginning was here he is asking me to assist him with - we call it the crazy project. And in the beginning, I was not going there in my mind. But he was determined, so I went for it with him. SHAPIRO: And how long did it take you to complete? BRYNJAR: It took me 11 months and 700 hours to fully complete it. SHAPIRO: After you spent so long working on it in private, what was it like to see the public response to this? BRYNJAR: It was so weird. The thinking of me and my mother - we're just thinking, ah, it's another ship day with the Titanic. But it's so fun to see their faces. Like they're fascinated by my project. That makes me more happy. SHAPIRO: Has this project and its worldwide success made you think differently about your autism? BRYNJAR: Well, first of all, autism is not a negative thing. It is not a negative thing. It is a gift because many autism people are really intelligent. Like many autism people can do stuff too. We are people as well. We just seem a little bit different on the outside. But the inside, we're always the same. SHAPIRO: Bjarney, what has it been like for you to see your son achieve this dream? LUDVIKSDOTTIR: It's undescribable. I mean, we never thought that this project would take us - the family on this journey. To tell you the truth, in the beginning, it was only to train him and teach him to start something and finish it. But when we discovered that it was motivating other kids - and it was also like a lesson for other kids that have autism that they can do whatever they can if they just follow their dreams and don't give up - I mean, we were amazed. SHAPIRO: Well, thank you both for talking with us. And I hope you enjoy your visit to the United States. BRYNJAR: Thank you very much. LUDVIKSDOTTIR: Thank you so much. (SOUNDBITE OF LEONID FEDOROV AND VLADIMIR VOLKOV AND JOHN MEDESKI AND MARC RIBOT'S "MORNING (UNDERWAY)") Transcript provided by NPR, Copyright NPR.